Now that I’m within striking distance of the end of my self-imposed year-long ban on drinking alcohol, I want to share my new appreciation for the surprisingly bifurcated nature of alcohol. A few weeks ago, I had quoted that 30% of American adults do not drink at all and another 30% drink less than one alcoholic beverage a week. Given how much time, energy, money, and everything else that the other 40% spend on alcohol (not to mention the negative consequences that result from drinking too much of it), am I the only one who is surprised to learn that for 60% of adult Americans alcohol is essentially a non-factor? This is how you read the graph: each group represents 10% of survey respondents, and, by extrapolation, 10% of all adult Americans. Starting on the left side, you have the folks who don’t drink at all – so you see “0 drinks,” meaning that these 10% chunks of Americans have no drinks in a typical week. As you move to the right of the graph, you see the results for the next 10% of adult Americans, and so on, and so on. Since the first three deciles each report 0 drinks, this means that it is estimated by this survey that a full 30% of adult Americans do not drink at all. The survey, just like all of the other stats I’ve seen about alcohol, refers to “drinks” according to the suggested serving size or the “standard drink.” That’s 12 ounces of regular beer (usually about 5% alcohol), 5 ounces of wine (typically about 12% alcohol), and 1.5 ounces of distilled spirits (about 40% alcohol). With that in mind, continue moving to the right of the graph to see the results for Americans who drink, starting with those who drink the least. This reveals that another 30% drink less than one drink per week — 0.02 drinks per week on average, 0.14 drinks per week, and 0.63 drinks. Keep moving right on the graph to discover that people in the 7th decile report drinking only 2 drinks per week and those in the 8th decile a little less than one drink per day. Now we’ve reached the part where the graph gets very, very interesting. The 9th decile reports drinking slightly more than 15 drinks per week on average. As I reported in January, before my New Year’s resolution, I typically drank two glasses of wine a night with dinner. This means that I certainly fell in the 9th decile of respondents to this survey. To put that another way, 90% of the American adult population drinks less than I used to! Now look at the results for the last decile on the graph. On average, this group reports drinking 73.85 drinks per week or more than 10 standard drinks per day. That’s more than the equivalent of 2 bottles of wine a day. And, if you do the math, the people in this top decile consume much more than half of all alcohol consumed by everyone. Although that’s extremely scary, I don’t doubt the veracity of the data. Do you? If this interests you, take a look at the post from the Washington Post Wonkblog where I found the information, the official results from the National Institute of Alcohol Abuse and Alcoholism study from which the data originates, the Amazon page for “Paying the Tab,” the 2007 book that shed light on the study, and a review of that book in the New England Journal of Medicine. And, for the 40% of Americans who have a few drinks (or more) per week and may, like me, have concerns about how that can lead to weight gain, the WP Wokblog also put together this helpful “Guide to Efficient Drinking” that ranks various alcoholic drinks by calories per ounce and calories per serving. Interesting. No doubt the data is, overall, on target. That said, it does make me think of my doctor’s joke about self-reported drinking frequency: “I take what the guy says he drinks per day and double it, and then what his wife reports he drinks and halve it, usually resulting in the same number.” Anyway, I wonder if some of the folks in the 2nd and 3rd highest deciles are under reporting but am also amazed that the top decline drinks (and admits to drinking) that much. I do sense a cultural divide of somewhat recent vintage between those who don’t (or rarely) drink and those for whom it’s a regular ritual, and this data seems consistent with that. Some people have refuted the data and the full data set is not downloadable online — although you can request it. 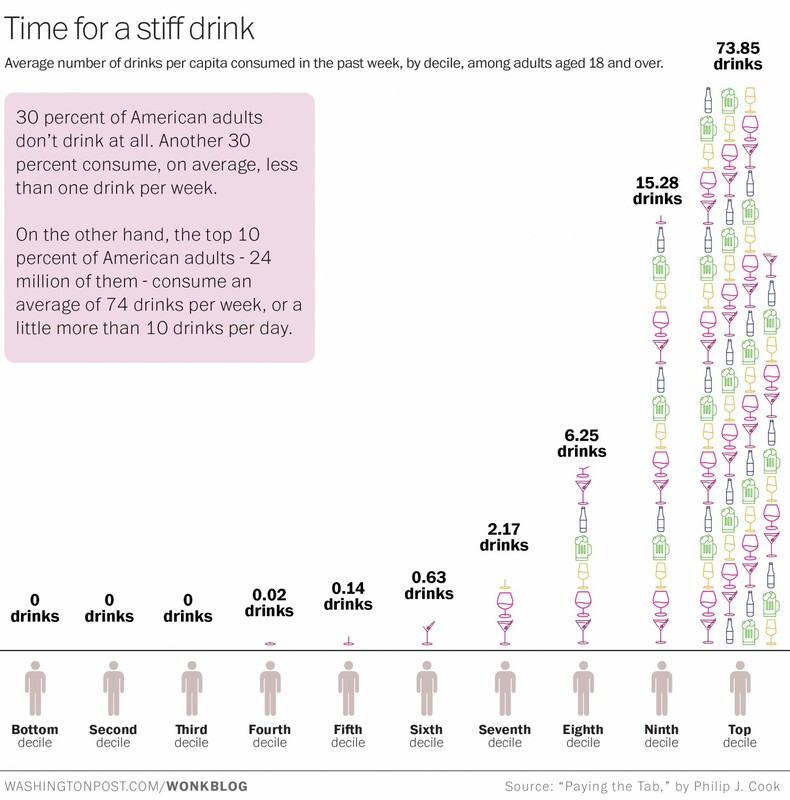 I certainly know people who drink 10 standard drinks per day…So, I believe the data, even if it surprised me.